Shyloh stayed with her foster family in MaPaw a long time before we found someone who was willing to work with a special needs dog. She was always friendly with other dogs, but she saw people as unpredictable and capable of inflicting pain. 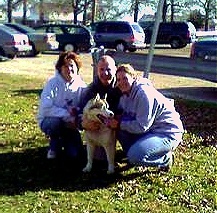 Finally, Shyloh found someone who had the patience and skills to help her overcome her fears and join the family. Shyloh was confused about leaving her foster home and living with a strange family. She loved her new canine pal but was still trying to understand the new surroundings and new routines. While she was trying to relax in the yard, a strange man entered her territory. Shyloh was terrified and wanted nothing more than to get away from the strange man. She saw that he had left an opening where she could escape from the fenced yard and she dashed for the only exit. Shyloh was gone. Shyloh’s new mom was horrified when she realized what had happened. Immediately she took the right steps for locating a lost dog. 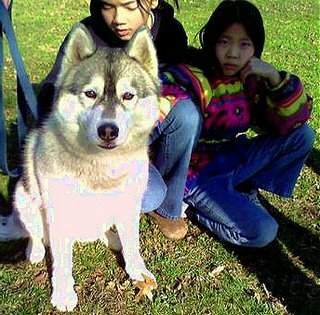 Her first step was to call MaPaw so we could get a group of volunteers working to find Shyloh. She followed up by contacting local shelters and the police department to report Shyloh missing. 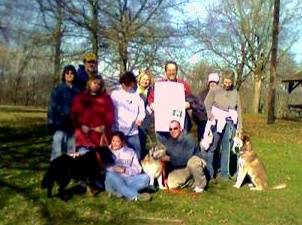 MaPaw volunteers jumped into action distributing flyers at neighbors’ houses, veterinary offices and the dog park. Several people called out of work to drive to Shyloh’s neighborhood and begin combing the woods. MaPaw would like to give a big thank you to Harnessed to Hope Northern Breed Rescue and Gimpy Dogs both of whom posted blogs calling for help in the search. 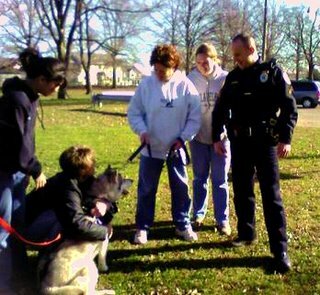 As well, we’d like to thank the Phoenixville Police Department and the Harnessed to Hope volunteers who came out to join the search. On Friday there was one sighting near the dog park early in the morning and then not another word about her. We were all worried that Shyloh just kept running and we would never see her again. We were worried that she was lost in the woods during hunting season. Saturday held more promise for Shyloh. More volunteers came out for the search. We believed she stayed in the area around the dog park because she so loves other dogs. Shyloh’s mom, Karen, brought her black, mixed-breed dog, Duncan, who had been very playful with Shyloh. A couple other noisy dogs came along to attract Shyloh. Everyone had their cell phones ready to connect in case of a sighting, and there were sightings. Someone would see a flash of brown and white fur through the trees and everyone else would gather at the spot, but Shyloh would be long gone. Again a searcher would see the flick of a fluffy tail and call to the others, but Shyloh was too quick. For hours the search was fruitless except to tell us that Shyloh was still alive and well. She used the thick forest to remain hidden. As the morning passed, the MaPaw volunteers developed a plan about what to do if Shyloh couldn’t be captured before dark. They decided on a placement for the Havahart Trap and a plan about how to continue the search on Sunday. Although they all had better ways to spend a Saturday, they just kept agreeing to do one more sweep and then one more sweep after that. In one of those sweeps Karen spotted her Shyloh and decided to try to attract her using Duncan, her mixed breed brother who could be trusted off lead. Karen removed Duncan’s lead and let him run to Shyloh. Shyloh was happy to see her brother. She playbowed and skipped around him. They wrestled in the woods while Karen crept toward them. Karen knew Shyloh would run if she got too close, so she called Duncan hoping that Shyloh would follow. It started to work, but Shyloh turned in the other direction once she got within a few feet. Karen kept trying to stay close to the playing dogs without getting so close she scared Shyloh. She, like all the volunteers, was dirty and exhausted. If the dogs would stay in one area, the other volunteers might have time to surround them. As the searchers hurried to get to Shyloh while she was distracted with play, Karen lay on the ground to avoid towering over the skittish dog. Slowly, she moved one arm toward the romping dogs. She kept her eyes straight up at the sky and used only her peripheral vision to aim. She tried to grab Shyloh but missed. She moved slowly back into position, grabbed, and missed. The volunteers were getting closer, but they were just as concerned about causing Shyloh to run before she was completely surrounded. Karen grabbed again. This time she caught some fur and held tight. In desperation, Karen used her whole body to trap Shyloh. It would startle the easily frightened dog, but it was Karen’s best chance to catch her. Shyloh was captured. Karen got the leash on Shyloh before trying to get off the ground. Other volunteers rushed in to help and to share in the joy and relief. Shyloh refused to walk on lead, and rather then risk her backing out of the collar, Karen just carried her out of the woods. A MaPaw volunteer saw Karen struggling to carry Shyloh, and took over for her so she could keep an eye on Duncan and begin to relax. Shyloh got a firm hug once she was out of the woods. She also got a firm talk about the dangers of escaping from both MaPaw people and Officer Gold. She was smelly, but otherwise no worse for the wear. We are so grateful that Shyloh is safe and sound and so thankful to everyone who helped relocate her.